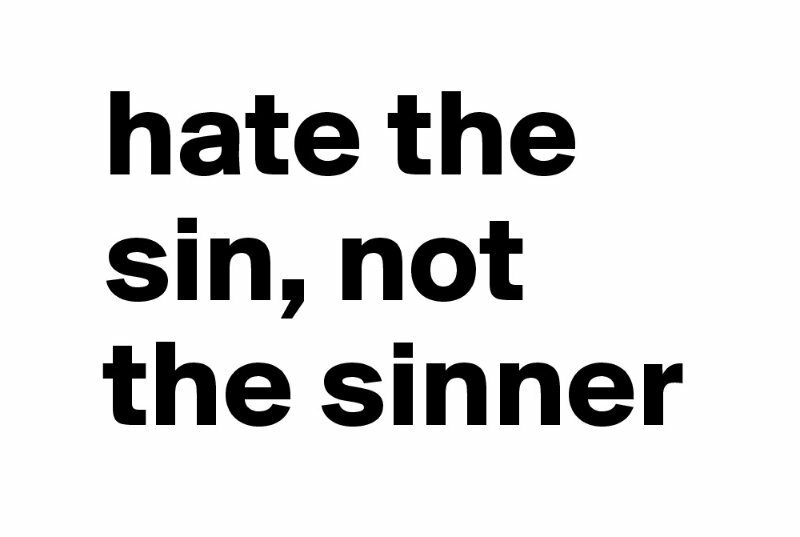 I suspect we are all familiar with the phrase, “Condemn the sin, not the sinner,” or “Hate the sin, but don’t hate the sinner.” Today’s gospel provides the perfect example of how this was the principle Jesus employed when he confronted sin and sinners. In this fallen world, we are very familiar with both sin and sinners. We encounter sin every day, both in our own lives and in the lives of others. There are two wrong ways to react to this. First, it is wrong to ignore the reality of sin. This is the mistake made by today’s popular culture, which considers tolerance the highest value. This is what Pope Emeritus Benedict called the tyranny of relativism. It’s the common attitude that says everyone can do whatever they feel like, that there are no objectively evil actions. In other words, sin doesn’t exist. It’s the idea that we are all free to do whatever suits our preferences and those who disagree with them are either bigots, haters or just old-fashioned and not with the times. In spite of the fact that Christ and his Church are very clear that objective moral truth indeed exists, our culture wants us to buy into the notion there are no absolute standards by which God wants us to live. The bottom line is that if we accept the secular culture’s point of view, we end up condoning evil. That’s tantamount to approving of people destroying themselves, because sin is always self-destructive. Plain and simple, it is wrong to ignore the reality of sin and not to call it out for what it is. In the gospel account we just heard, Christ clearly condemns the sin of the adulterous woman. He tells her: “Go, and from now on do not sin anymore.” He certainly didn’t ignore the sin. He forgave her, but warned her that she must now stop sinning. In no way did he condone her sinful behavior. While it is clearly wrong to ignore the reality of sin, it is equally wrong to condemn those who sin because of their sinful behavior. Jesus’ attitude toward this adulteress shows that we are not condemn the sinner even though we denounce the sin. When people engage in evil behaviors, they are not rejected by God. God still loves them and wants them to repent and be saved. As God’s children we are called to have the same attitude as our heavenly father toward those who persist in sin. Only God knows the heart of the sinner. Only God knows how responsible that person is for the evil choices they make. Only God knows that person’s whole history. As such, only God can judge people fairly. We can condemn evil actions, and we must. As a society, we punish people for crimes and limit their freedom so that they do less damage, but only God can condemn the actual person. God’s love for us is unconditional. This is his policy. This is how he rolls. Christ came to give all of us sinners a second chance. In fact, he gives us an unlimited number of chances to turn our backs on our sinful patterns of behavior because he doesn’t want to lose a single one of us. It can be very difficult not to condemn those who flaunt their sinfulness, as we can easily resent them for it. There are so many examples in our secular world of people who celebrate sinful behavior that it can be challenging for us to love them unconditionally as God loves them. One way to improve our ability to separate the sin from the sinner is simply to practice doing it. Like every virtue, this one grows when we exercise it. One area where we have plenty of opportunity to practice this is in our conversations. Throughout time people have derived a sinister pleasure from talking badly about other people. We run into it every day. Around the water cooler, in the lunchroom, in the parking lot conversations begin with “Did you hear what so-and-so did?…” and then comes the scandalous story, the story about something bad that someone supposedly did. When someone starts telling us one of these stories, it is the perfect opportunity to reverse our own sinful tendencies by not taking part in the conversation. This is a simple application of the command to love one’s neighbor as oneself. Do we want people speaking badly about us? Of course not. So we should make it a policy not to listen to people speaking badly about others. We can’t help hearing stories, but we can refuse to take pleasure in it, and refuse to believe any evil that we hear about others unless we see it with our own eyes. And even if we do see it with our own eyes, we can be determined not gossip about it, taking pleasure in someone else’s faults. We have plenty of our own faults to worry about, and that’s where our focus should be. Starting today, let’s make it our primary effort to reform our own lives, rather than the lives of others. We should pray that others will come to know and repent of their sins, but not before we recognize and root out sin from our own lives. We must love our neighbor, with all of their flaws and faults, just like we want others to love us in spite of our flaws and faults. We are all sinners and we are all loved equally by God. Yes, we must continue to speak out against the sinful practices and beliefs of our time. As with all of God’s objective truths, we do so for the good of those who are blind to their sin and are placing themselves in jeopardy of eternal separation from God. However, we must never condemn those who commit the sins, as this is simply not our job. We must love them and pray for them, in the same way we hope they love and pray for us when they observe us committing our own sinful behaviors. Let us resolve to do unto others as we would have them do unto us.